Old Dominion Animal Hospital is thankful to be a member of the “International Association of Animal Hospice and Palliative Care”. We also work with several local organizations that can provide support for those with an aging pet, including Peaceful Passings. Animal hospice gives families more time with a senior pet and eases the adjustment approaching death. This strengthening of the bond between owner and pet aids in preparing for the loss of a precious companion. Animal hospice also makes it possible for pets to enjoy the final days of life at home, in the company of the ones they love. Our animal hospital family knows how hard it can be for your family as your pet develops life changing or age related conditions like cancer, kidney failure, or dementia. Sometimes despite everyone’s best efforts these conditions do not respond to therapy. You may be faced with trying to make your pet as comfortable as possible during his/her last days. That’s why our veterinarians and staff are ready with animal hospice care. Old Dominion Animal Hospital has set aside a “quiet room” where we can offer quality of life advice in a homey, more peaceful atmosphere. We are ready to assess your pet’s health condition and help you with a care plan during this difficult time. At some point, the kindest thing for your pet may be euthanasia. 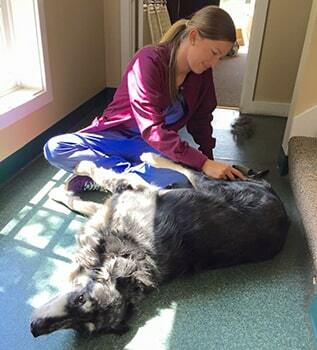 Our veterinarians can offer a humane and painless passing. Facing the loss of your pet can be difficult enough, so as a special service to our veterinary family members Old Dominion offers euthanasia for your pet at no fee. We see it as the last thing we can do for you and your pet, so we never charge for euthanizing a long time friend. An independent service company or the Charlottesville SPCA will charge, through us, a separate fee depending on the burial plan you have chosen for your pet. We are happy to take care of all these arrangements for you.